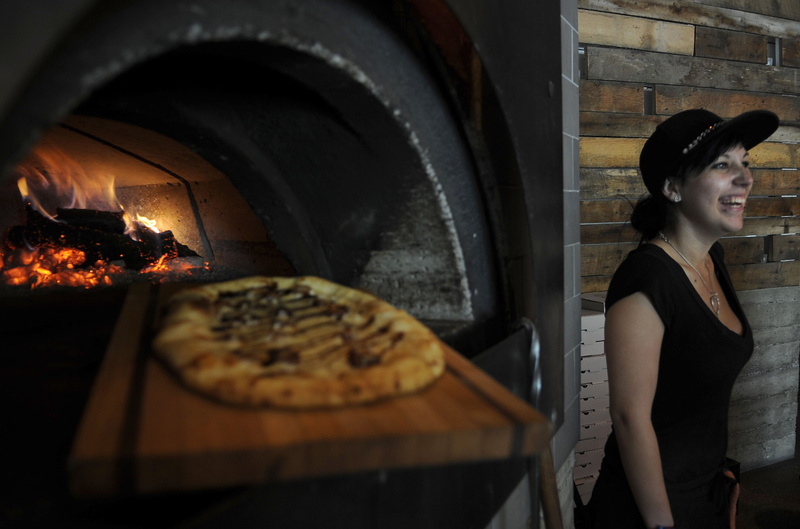 Fire Artisan Pizza is coming to downtown. The Coeur d’Alene restaurant announced on its Facebook page last week plans to open a second location. Managing partner Doug Johnson said the aim is to open in December. When most Americans think of pizza, they think of something that arrives on their doorstep in a box. Or worse, something that comes from a grocery store freezer. Something that’s cheap and, frankly, boring. Fortunately, there’s a cure for the pizza blues and it can be found in downtown Coeur d’Alene. For just over a year, Fire Artisan Pizza has been hand-tossing its way into the hearts and stomachs of pizza fans. With its housemade crusts, creative toppings and industrial-cool vibe, it quickly became a favorite lunch and dinner spot in the Lake City. Last year, when I first walked into the place – which is not at all recognizable from its previous life as half of the Christmas decor shop Christmas at the Lake – I was quickly taken by it. Large black-and-white photos dominate the walls. It’s all concrete and hard surfaces, with fun woody details sprinkled throughout. The reception desk sits upon what looks to be a stack of firewood. Walls of reclaimed wood separate rows of booths, and pizzas arrive at your table upon wooden slabs. The pizza oven dominates the open kitchen in the back corner, so you can watch the pizza chefs shape your pie, add toppings and slide it into the blistering hot fire. The menu features an extensive wine and bottled beer list. There are only four beer taps, and on a recent visit they had just drained the keg of St. Stephen from Post Falls’ Selkirk Abbey Brewing Company, which meant there was no local option to drink. Still, my tasty IPA from Colorado hit the spot. On my previous trips to Fire, I’ve pretty much focused on one pizza – The Gordy. It’s topped with dates, gorgonzola, mozzarella, olive oil and drizzled with a balsamic reduction. If this strikes you as weird, don’t worry. That’s how it struck me, too. Until I tried it. With the first bite, I saw what they were going for. The sweetness of the dates and the balsamic paired beautifully with the tanginess of the gorgonzola. The crust, which comes out of the oven crisp and pleasingly charred, helps brings all these flavors together for a really delicious experience. This is an exceptional pizza, one that I’m happy to order again and again. Fortunately, my husband is more adventurous when he orders, which means I’ve been able to sample other pies. The Parma is another hit, with prosciutto and four cheeses – gorgonzola, pecorino, mozzarella and provolone – and finished with truffle oil. The strongly flavored gorgonzola and pecorino are a great combination with the milder mozzarella and provolone; add in the saltiness of the prosciutto and the luxuriousness of the truffle oil and you get eight slices of heaven. For the meat-eaters out there, there’s the simply named Meat. It’s got a little bit of everything. Fennel sausage, pepperoni, salami and bacon and mozzarella. Super tasty. Even my picky 8-year-old daughter thought so, as she sat there and stole the toppings, piece by piece, from a slice on the serving board. The Bar-b, with barbecue sauce, roasted chicken, Kansas City bacon, smoked provolone, gouda, red onion and fresh cilantro, is a great option for those who like their pizza decidedly un-Italian. And for as much as I have had great pizza at Fire, I have to admit to being unimpressed with one menu offering – the Margherita. This classic pizza is the height of simplicity. Crust, tomatoes, cheese and basil. On our recent visit, we ordered a Margherita for the kids. And it was great for them. The picky 8-year-old inhaled hers. But when I tried it? Meh. I was struck by how bland the pizza was. Tasted separately, the tomato sauce was fresh and lively. But it was completely washed out by the mild mozzarella. The sauce also seemed a bit wet, which meant the toppings slid right off the crust. Still, there is plenty to love about a Fire pizza. And plenty to keep me coming back for more.